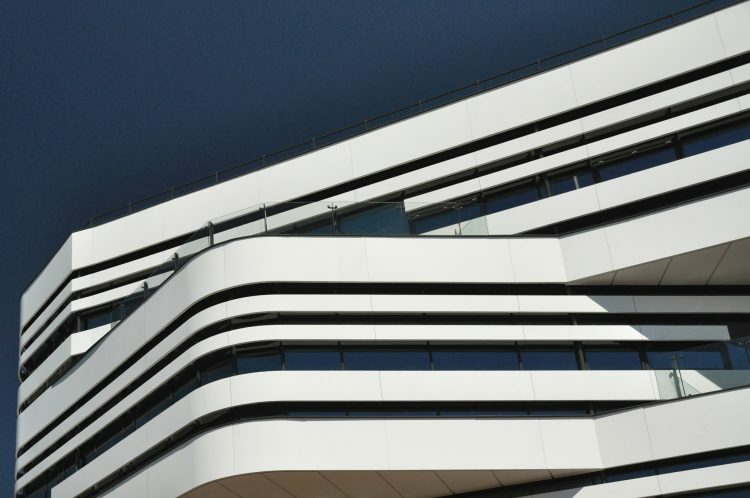 Bournemouth University’s Fusion building is state of the art – a modern design and planning process using BIM, sustainable materials and ordered floor plans to facilitate the exchange of the faculties. 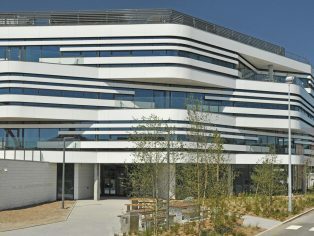 The Fusion building of Bournemouth University has been designed to intensify the exchange between teaching, research and the business world and is the new flagship academic building on the campus. Formerly the site had been an odd car park in the midst of the campus. Now it joins different facilities in one place, which had been dispersed on different places. The area around the building being already occupied on two sides Fusion 1 is some kind of a ‘building with no back’. Fusion 1 is built on a concrete frame rising from the ground and a steel frame descending from the roof. The walls inside are plasterboard and thus allow flexibility for future changes. Concrete columns are holding the structure. The exterior design strikes with a pristine play of black, white and grey. 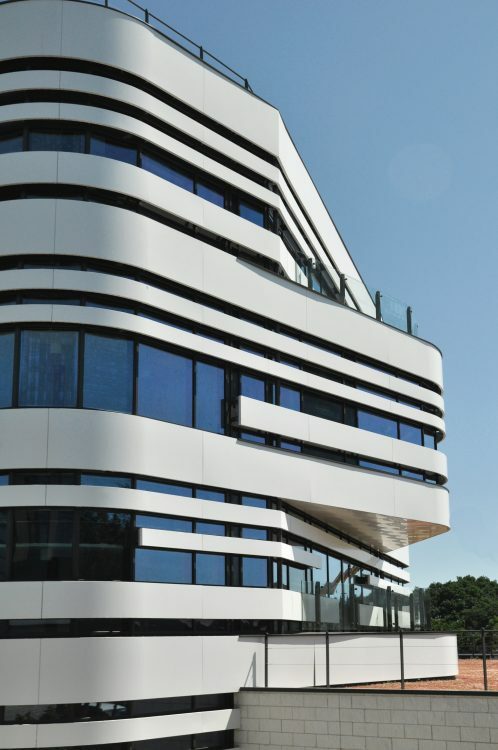 The white ALUCOBOND® cladding provides fresh modernity to the grey zinc. The balconies are arranged in an irregular manner and thus break up the design of the facade. The university wanted to make a clear statement of its ‘green’ commitment. In order to save on energy costs 200m² of photovoltaic panels are placed on the roof and 11 ground source heat pumps are driven into the grounds. The triple glazed windows avoid air leakage. Therefore sustainability was an important feature not only in the design but in the choice of materials as well. 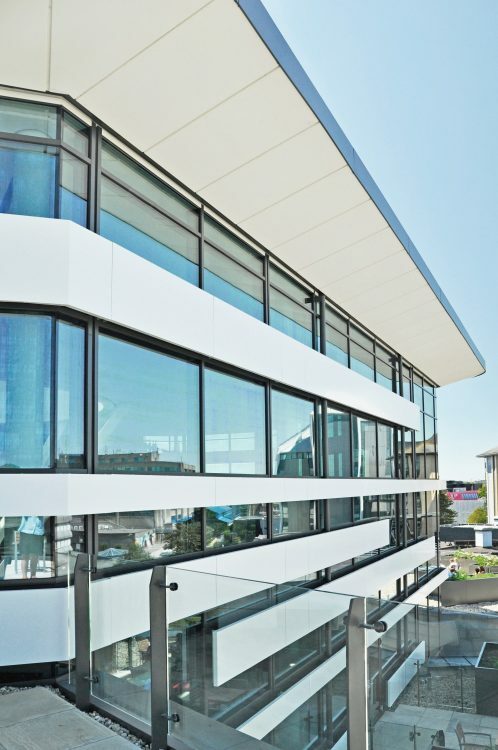 Zinc and ALUCOBOND® are eco-friendly materials. 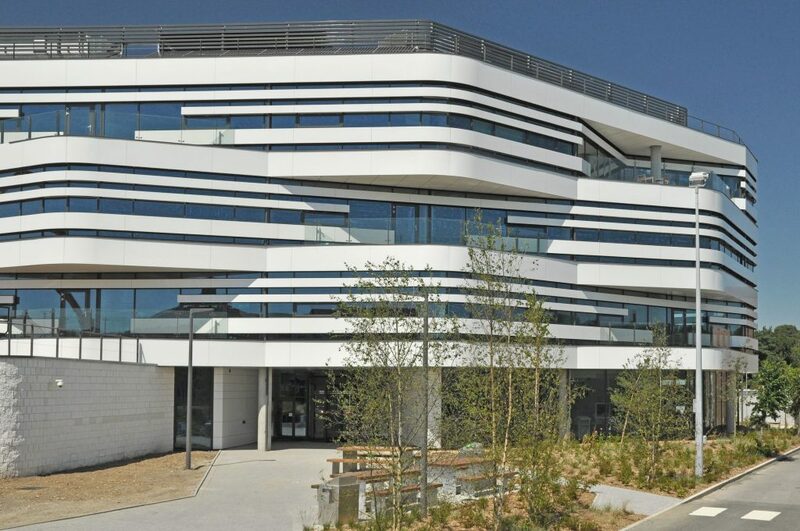 The building has achieved a BREEAM excellent status. In today’s construction the process of planning is on new paths. The use of BIM helps to design, plan and manage the project. 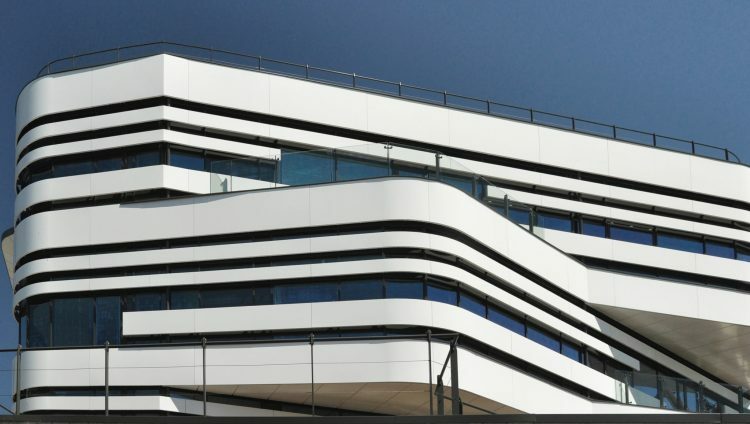 ALUCOBOND® provides shaders and BIM objects for AutoCAD and Revit in order to facilitate the architects’ work. The new Fusion building is state of the art, because it encourages the exchange of different faculties during operation, but already was a modern project in the status of design and planning.